The dreamcatcher is a Native American Indian craft. 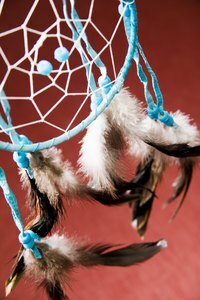 The traditional dreamcatcher was made to protect an individual from bad dreams. The premise of the dreamcatcher is to catch the bad dreams in the center hole of the web while allowing the good dreams to pass through. The good dreams then follow the feathers down and float into the mind of the sleeping individual. You can individualize the center design in a dreamcatcher with the basic dreamcatcher stitch. Cut a piece of sinew approximately 9 yards long. Tie one end of the sinew in a knot around the wrapped hoop. Pull the free end of the sinew to the front of the hoop. Place the sinew loosely over the edge of the hoop and drape it to the back approximately 1 1/2 inch from the knot. Place the end of the sinew from the back of the hoop through the hole made from draping it over the edge of the wrapped hoop. Pull the sinew tight. Repeat the basic dreamcatcher weave around the circumference of the wrapped hoop and the center of each weave until the center of the hoop is reached. Tie a knot in the sinew at the center of the dreamcatcher. Cut the excess approximately 1/16 inch from the knot. Tie the sinew to the wrapped hoop with a knot. Place the sinew across the wrapped hoop approximately 3 5/8 inches from the knot. Complete a basic dreamcatcher weave. Repeat the process around the hoop creating five individual points. Connect the five points of the star with the last weave. Complete a basic dreamcatcher weave directly next to the attachment knot. Place the sinew in the center of the first basic dreamcatcher weave around the circumference of the hoop. Repeat the process in the center of each weave until the center is reached. Place the sinew across the wrapped hoop approximately 1 inch from the knot. Complete the basic dreamcatcher weave around the circumference of the wrapped hoop. Place the sinew in the center of the first basic dreamcatcher weave around the circumference of the hoop. Repeat the process to complete the second row. Place the sinew in the center of the second opening to the right of the basic dreamcatcher weave to create the next basic dreamcatcher weave. Skip one opening and complete a basic dreamcatcher weave. Repeat the process to the center of the dreamcatcher. Pull the sinew tight after each basic dreamcatcher weave. This will keep the design taut for many years to come.